At the end of August 2016 the Brazilian Senate voted to impeach President Dilma Rousseff of the leftist Partido dos Trabalhadores (PT), finding her guilty of breaking budgetary laws, and confirmed Michel Temer of the centrist Partido do Movimento Democrático Brasileiro (PMDB) as president until the end of 2018. Although Mr Temer has a majority in Congress, governability will continue to be hindered by the on-going corruption investigations at the state oil company Petrobras. State prosecutors alleged leading construction companies and other businesses paid huge bribes to high-ranking officials of Petrobras and to politicians in return for contracts. So far, over half of Congress members and even President Temer have been implicated, which potentially could lead to his resignation should the bribery allegations materialise. 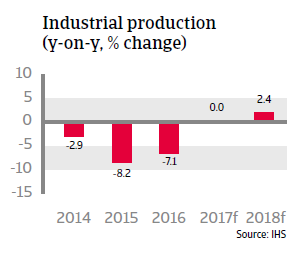 Brazil´s economy contracted by more than 3% in 2015 and 2016, due to weak foreign demand and decreased commodity prices, while private consumption, investment and industrial production declined sharply. The fallout after the Petrobras corruption scandal has hit the economy hard, as investments in energy and in infrastructure have been put on hold, and many businesses face financial difficulties. 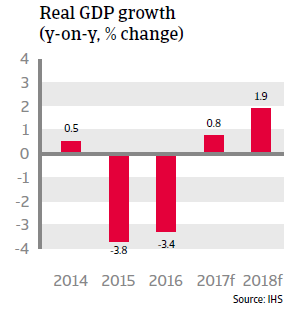 Since taking office, President Temer and his economic advisors launched more orthodox economic policies in order to improve government finances, increase investors sentiment and pull the economy out of crisis. This includes constitutional amendments to curb public spending growth and to improve the credibility of the Central Bank. The administration also started to tackle much needed pension and social security system reforms, to address labour market rigidity and reduce bureaucracy, but progress in those areas is expected to be very slow in the current volatile political environment. 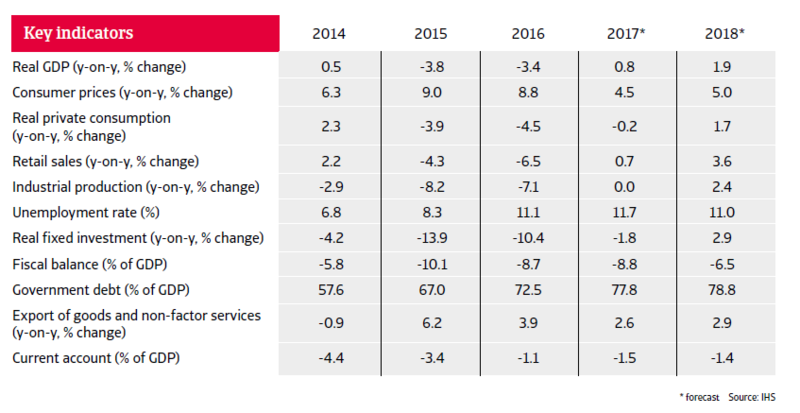 In 2017 a modest economic rebound is expected, on the back of improved business confidence, the government’s infrastructure investment plans and monetary policy easing. 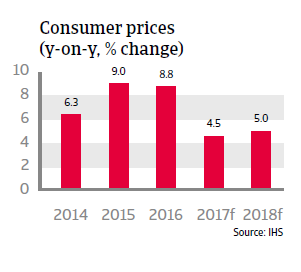 Since the end of 2016 the central bank has started to lower the benchmark interest rate again as inflation began to decrease, and this certainly helps to bolster investments and lending. Further inflation containment is a prerequisite for additional downward interest rate adjustments in 2017. 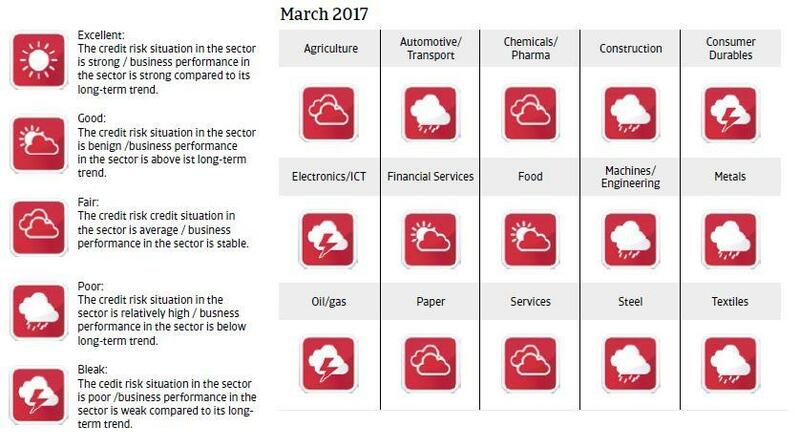 However, the economic environment will remain challenging, given a much needed fiscal policy adjustment, high unemployment of more than 10%, a weak manufacturing sector and recent declines in business and consumer confidence. Exports have so far contributed positively to economic growth, but orders indicate a lower increase in 2017. Currency volatility is likely to persist, given the current political volatility and uncertainty over US trade policies, which could lead to another depreciation. Due to the economic contraction, business insolvencies have increased significantly (in particular judicial recovery cases rose about 45% year-on-year in 2016), and this trend is expected to continue as the rebound is feeble and banks are still reluctant to lend. Business insolvencies are expected to increase further in 2017, by about 10%. Until early 2015 Brazil´s fiscal policy was quite expansionary, as investment to exploit the huge offshore oil fields, the 2014 FIFA World Cup and the 2016 Olympics fuelled spending in the public sector. 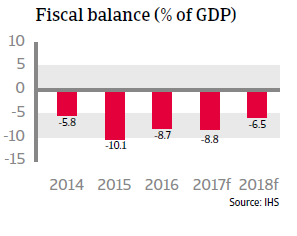 The fiscal deficit decreased in 2016, but due to the weak economic performance it is expected to remain high in 2017 and 2018. The recent adoption of a constitutional amendment to eliminate automatic budget spending growth in line with inflation increases is a crucial step to curb spending. But even with this measure a return to primary surpluses is not foreseen until 2020. Currency, refinancing and sovereign default risks are mitigated by the fact that 85% of government debt is financed domestically (95% in local currency) at an average maturity of almost seven years, while the government is a net-external creditor. However, government debt has increased to 72.5% of GDP in 2016 and is forecast to rise above 90% in 2020 before levelling off; which is faster and higher than previously expected. Therefore, progress in containing government debt is crucial in retaining business and investors’ confidence and the country´s creditworthiness. Foreign currency debt has risen in recent years on the back of sharply rising corporate debt (up to about 60% of total foreign currency debt). However, this debt level has stabilised in 2016, and two thirds of foreign currency corporate debt is intercompany debt, which is less exposed to refinancing risk. Most externally indebted businesses have either hedged their currency risk or have access to large foreign currency reserves. Brazil´s banking sector is well regulated and sufficiently capitalised. The system is not dollarized and the dependency on external wholesale financing is low, shielding the banking system from adverse shocks. That said, the share of non-performing loans has increased to almost 4% in 2016, with mainly small- and medium-sized businesses affected. Brazil remains vulnerable to changing investors’ sentiment, due to a relatively high stock of portfolio investment inflows (130% of international reserves). Political uncertainty over the Petrobras corruption scandal and the future US trade policy will keep the currency vulnerable to shifts in market sentiment. However, a strong financial sector and relatively low external refinancing needs enable the flexible exchange rate to act as a shock absorber. Brazil´s external financial situation is expected to remain robust. External debt is still quite low and liquidity is more than sufficient to cover imports (more than 20 months) and external refinancing needs. 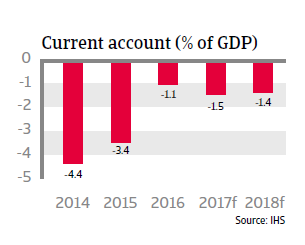 The current account deficit remains low in 2017 on the back of decreased imports, and is fully covered by foreign direct investment.